Here is a step by step on how to combine VOB files from a DVD movie into a single VOB file using DVD Decrypter. *Note* DVD Decrypter is a free download and you should never have to pay for it. You can download it here. STEP 1: Insert DVD movie in DVD ROM/RW drive. 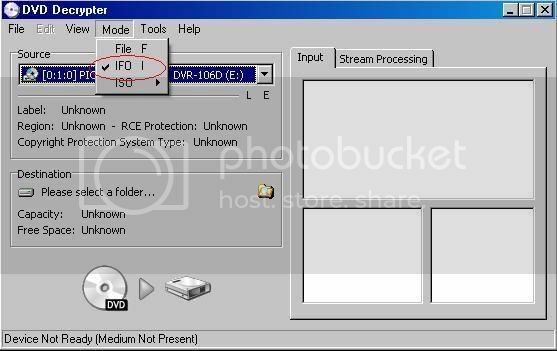 Start DVD Decrypter, select Mode then scroll down to IFO and click. 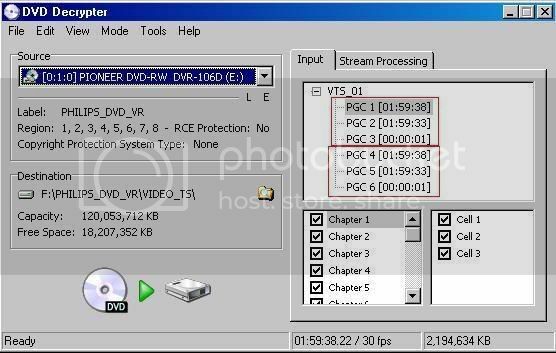 STEP 2: You need to configure DVD Decrypter on the maximum output file size. Since Archos uses a FAT32 system, the file size cannot be bigger than 4GB. Bring up the Settings dialog by clicking on Tools, then scroll down to Settings. In the Settings window select the "IFO Mode" tab, and under File Splitting select 4GB then click OK. STEP 3: On the right hand side you will then see an INPUT tab. This will display a list of numbered titles such as PGC 1, PGC 2, etc. Highlight the one that has the longest running time. It is almost always the first one. That is your movie. Make sure all the chapters and cells are checked in the boxes below. STEP 4: Select the destination as to where you want the VOB file to be copied. You can either leave the default destination or select or create new folder by clicking on the icon. Browse for a drive or folder & make a new directory of your choice. 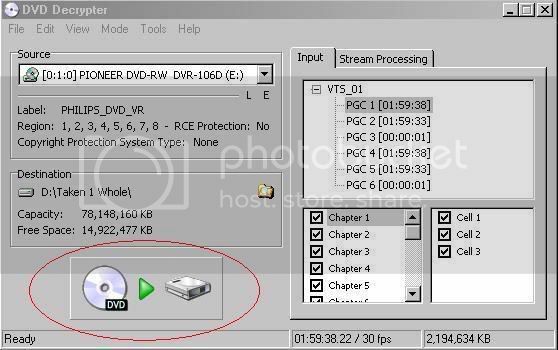 STEP 5: Click on the large DVD icon as shown in the picture below and wait for DVD Decrypter to copy the VOB to your destination folder. This should be fairly quick since the data will be copied at the speed of your DVD drive. Usually takes no more than 20 minutes. CONGRATULATIONS!! You are now done!!! Your VOB file is now ready to be imported onto your favorite ARCHOS device (404, 504, 604, 604 WIFI) in true DVD resolution 720x480 and true 5.1 surround sound (only when viewed using the DVR docking adapter). Remember, VOB files will only play with the cinema plugin. Last edited by towers on Thu Nov 16, 2006 8:35 pm, edited 2 times in total. Nice one,I was thinking it was about time someone did some sort of straight forward guide. Words cant decribe how good this guide is. Ive been looking for something like this online for the longest time with no luck. Time to go stack my 504 with tons of movies in full Dvd resolution. Im so excited! Thank you so much. This definately needs to be stickied. Last edited by NYCmedia on Thu Nov 16, 2006 7:57 pm, edited 1 time in total. No problem guys. We're all here to help one another. Ive edited my post above to include a direct link to download DVD Decrypter for those who dont have it or dont know where to get it. I have a movie that I tried your guide on but I am getting some missed up sound on one movie but I tried it on another movie and it worked fine. Not sure what I am doing wrong on the second movie and unfortunetly it creates 2 Vob files which stinks because of the transition from one VOB to the other. Your guide is the best in terms of a quality picture and sound. Do use dvdshrink? and if so could you create a guide for that I am having issues with it. Cant seem to find the correct IFO file so I rename the IFO but I still cant get it to work. What do you mean by "missed up sound"? 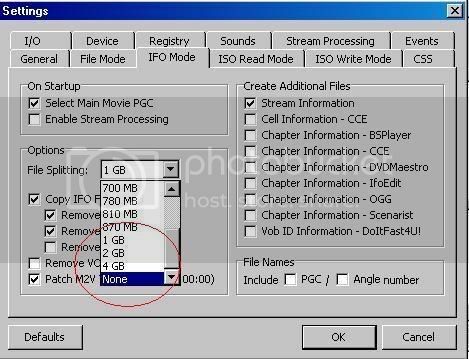 There is nothing you can do about the program creating 2 VOB files if the movie exceeds 4GB. Im not sure what all the fuss is about and why so many people are complaining when 2 VOB files are created. BIG fu**ing DEAL if there is a slight pause when it transitions between VOB 1 and VOB 2. Its only takes like a second. Deal with it. Think of it as a layer change when watching a DVD movie on a DVD player. There is a slight pause there as well. I dont use DVD shrink, but if it doesnt work on Decrypter, it probably wont work on Shrink either. I will check out DVD shrink when I have some time and maybe create a guide. But I still dont understand your problem (missed up sound?) Maybe your ARCHOS settings are incorrect or you have changed some settings in Decrypter. I would just like to thank Towers for his great guide. I just finished putting my 20th movie on my 160gb 504 all in Vob format and everything worked flawlessly. THANK YOU SO MUCH. Who are the moderators on these forums. why isnt this thread stickied yet. Its probably some of the best info on here. Last edited by Mojorisin69 on Fri Nov 17, 2006 11:33 pm, edited 1 time in total. If you were to use DVD Shrink it would be possible to seperate the movie into two halves at a point where the change from one VOB to another wouldn't really be noticed. If you did it right as well you could get away with not having to "shrink" the VOB files at all. I tried this & I can't get over how quick it is. Especially since I have the Cinema plug in. :-) I love it! Thank you Towers!!! The only problem with DVD Decrypter is that the courts caught up with them over a year and a half ago so there will be no more updates. It will not work with many of the newer movies. Do you have to have the cinema plug-in to view VOBs then? You do need the cinema plug-in but even with that my vob video is very choppy. Choppy? How so?? Can you explain in more detail. You must be doing something wrong. Your video shouldn't be choppy at all. I don't know what I could be doing wrong. I have the cinema plug-in and downloaded several vob files that play fine on my computer just fine. Each one of them plays with a choppy audio. i just use dvdshrink(also free), and encode with picketdivxencoder. PDE will pull the vob files. between both free programs, i can create an excellent avi file of a movie at 700mb....= 40 movies on a 30gb player.